At almost every corner you will find a stall or a stand with a variety of ingredients available for any typical kind of Vietnamese food such as soups, rice, meat, noodles, banh mi, rolls, etc. Depending on the time of the day, these stalls will sell certain foods fitting the demands of people. The street restaurants are often focused on only two or three meals; and having meals in these restaurants is a great choice. 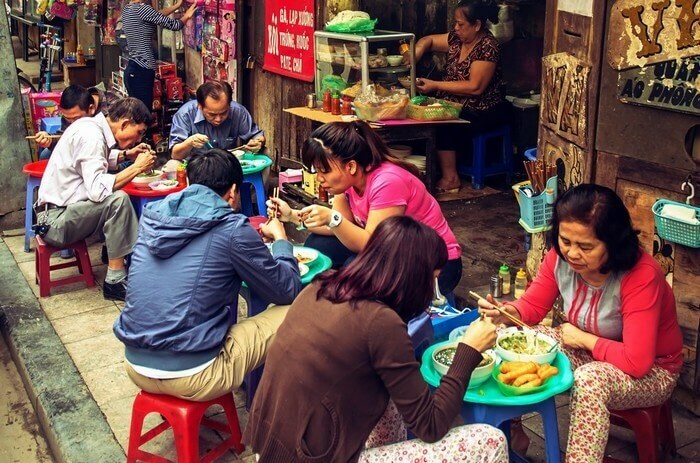 Hanoi is famous as a paradise of street food; therefore, it is one of the must-go places for international visitors who desperate to discover about Vietnamese world of food. 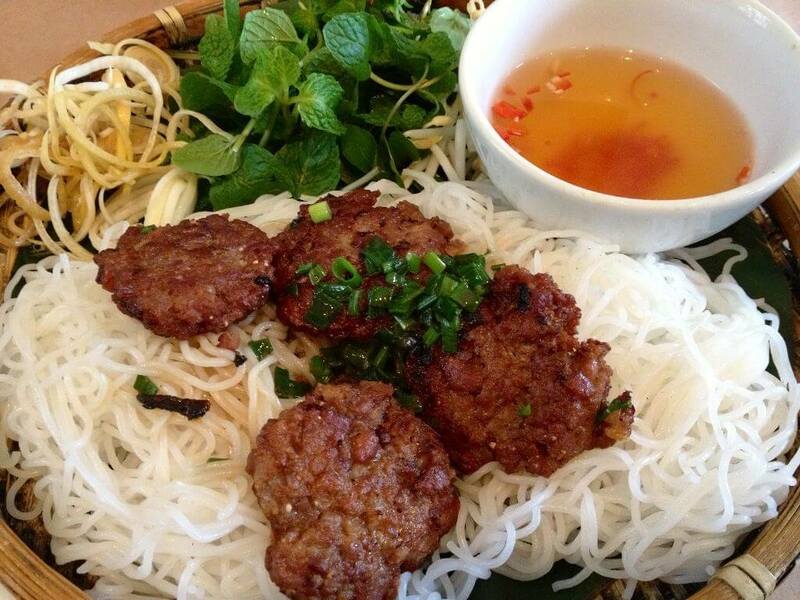 You can find almost all kinds of Vietnamese northern foods there. Besides there are many other well-known names which represent different regional cuisines such as: HCMC, Hue, Da Nang, Hai Phong, Dong Thap, etc. Vietnam is the second-largest rice exporter in the world. Therefore, it is no surprise that rice is the main thing that Vietnamese people have in every meal. Also, rice is a common ingredient in making Vietnamese foods such as rice noodles, rice paper wrappers, congee, sticky rice with fruit, fried rice, puffed rice snacks, and rice wine. Another special part of Vietnamese food is fish sauce. As in its name, fish sauce is made from fish and salt. This combination is fermented for weeks or even up to two years to become a condiment as well as irreplaceable dipping sauce in Vietnamese traditional meals. There are large differences among foods in different areas: in northern region, southern region, the central, and even in the mountainous areas and lowlands. However, various kinds of vegetables, fruits, herbs and spices are indispensable. A very famous drink of Vietnam is tea, particularly Vietnamese street iced tea. Besides, beer is nearly a part of the young’s “norm”. If you come to Hanoi someday and want to try Vietnamese “beer culture”, then you should find the way to Ta Hien street. Every night, this street is crowded with people from everywhere including both Vietnamese and international visitors. Another drink that you cannot ignore when coming to Vietnam is coffee. 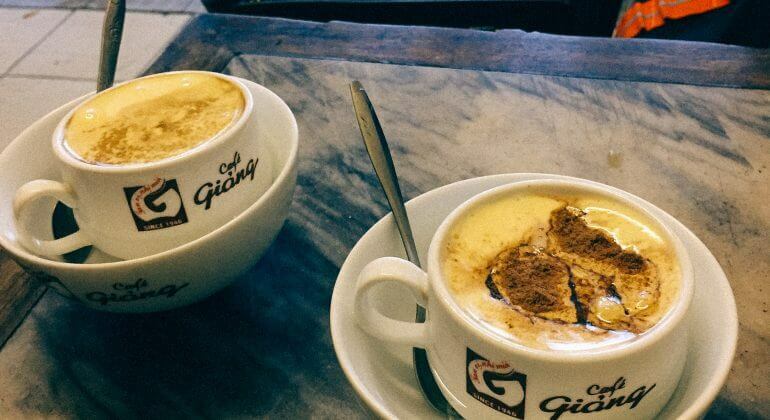 There are well-known kinds of coffee such as black coffee, white coffee (black coffee with condensed milk), iced coffee, coffee with eggs – this specialty you can try in the Old Square: Café Giang Café Dinh or you can find it in many coffee shops around Hanoi. Using Foody app is a wise choice for you to explore all the famous places of food and drinks. Ratings, comments, reviews, almost all the information you need is included in the app. If you are a real gourmet, and you are not afraid of any kind of food (by which I mean even bizarre foods) while discovering the mountainous areas of Vietnam, you should take the chance and have some meal with the local families. People in mountainous areas are very kind and honest. And their foods are special in their own way, quite “mountainous” with the ingredients from mountains, lands of rocks and wild plants. Some foods are easy to eat and tasty like smoked buffalo meat, grilled duck, but some are so strange that you might be hesitant to try like Thang Co. These foods are usually served with rice wine or corn wine.